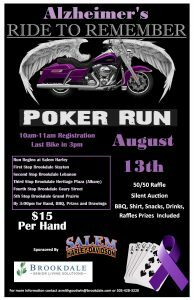 Come out and enjoy the Alzheimer’s Ride to Remember Poker Run on August 13th! Registration is from 10-11 am, and the last bike must be in by 3 pm. There’s a series of five stops, beginning at Salem Harley and Brookdale Lebanon, and ending at Brookdale Grand Prairie. It is $15 per hand. For more information, please contact Holly D’Amore: hdamore@brookdale.com / 541-258-7706.